With no points dropped nor goals conceded, an armchair supporter could easily brag that the league has been won already. In reality, whilst the Spireites have deserved their impressive start, Chesterfield are far from invincible and far from the perfect team. It would be harsh not to give the team credit after such a positive opening to the campaign, and the squad that Martin Allen has put together is showing major potential. But many supporters – and Martin Allen himself – would agree that the performances away at Ebbsfleet and at home to Braintree were not of the highest standard, especially in the opening halves of both fixtures. While Shwan Jalal and his Spireites defence are yet to concede this season, it may have come with a touch of luck, considering both Aldershot and Braintree were reasonably unlucky not to have scored in their visits to the Proact. Mistakes will inevitably come, such as Talbot’s against Braintree which forced Jalal to come to the rescue, and that is a natural part of the game, but there are still ways in which the Blues can improve in the games to come. 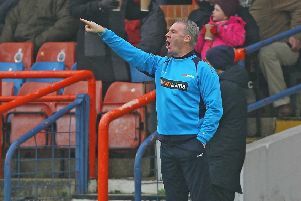 After a fairly comfortable outing against Aldershot, it perhaps was tougher for Chesterfield to adapt to Braintree’s high pressing on Saturday which caused some discomfort at the back at times and forced the back four to exchange passes more frequently and revert to pitching the ball long. Considering that Martin Allen’s side will face much better teams than Braintree this season, they will need to quickly learn how to deal with extra pressure when in possession; unlock this, and they will be an even harder team to beat than they already appear to be. Up the top end, attacking performances have pleased but there will always be room for improvement. The more clinical, the better, and at times the final ball in attacking movements could have been better. Having said all that, what the team is showing so far is both promising and somewhat relieving for the fans, who are watching a team play with passion for their passionate new manager. At the end of the day, we are only three games in. To expect perfection at such an early stage would be ludicrous. It’s a brand-new team which has won three from three and has bags of potential yet to be unlocked. There is plenty to improve upon but with Mad Dog Allen at the helm and the group of players at his disposal, it could never be in doubt that this side will grow over time. I said last week that if we could have six or seven points by the end of the Braintree fixture, then it would be a positive start. They’ve gone a step further than that to take maximum points, and it’s impossible to not feel optimistic about the coming season, regardless of how early it remains. They’re not the finished article, but they for sure have the potential to be.